The fruit produced by pineberry plants is very aromatic and has flavor that most say is reminiscent of pineapple while retaining the texture and feel of a strawberry. The pineberry, or pineapple strawberry, is more of a novelty at present. They are produced on a very small scale in Europe and Belize and are not very profitable due to the small size of the pineberries (large pineberries are less than an inch [2.54 cm] big) and the low yield of pineberry plants (see the videos below to better gauge the size of the berries). Yes, pineberries are real. The primary commercial cultivar is owned by strawberry breeder Hans de Jongh and the pineberries are sold by VitalBerry BV in the city of Made, Netherlands. Their supplier is Holland’s Beekers Berries who grows them in very large, commercial glasshouses. While the fruits are generally referred to as “pineberries,” the German word meaning pineapple strawberry, “ananaserdbeere,” is occasionally used to reference them as well. Questions over the existence of pineberries arose after two events cast doubts on their reality. The UK grocery store chain Waitrose was the only supplier of pineberries to the UK market. In the year Waitrose was to initially offer pineberries on a limited basis, they announced the new fruit offering just prior to April 1. Since the store chain had previously run “April Fools” ads for an obviously made up “pinana” (a pineapple banana), many assumed that the pineberry was a similar joke. Additionally, a search engine optimization company adopted Pineberry as its name just prior to the Waitrose announcement. The pineberry products showed on the SEO company’s sites were clearly not real products. These two concurrent happenings led to much skepticism and doubts about the existence of such pineapple strawberries. Commercial pineberries are only available for a period of about five weeks. If demand increases, production will likely rise to meet the demand. However, they have been sold in the UK in forty-five Waitrose stores in the past. They generally sold for £2.99 to £3.99 (approximately $4.50 to $6.00) for a 125 gram bag (4.4 oz). In 2012, pineberries were imported into the United States for commercial sale for the first time. They were available in New York from early May until mid-June. They were available in New York at Dean & DeLuca, Eataly, and Agata & Valentina. They were available for $5.99 per half-pint until after the middle of May, at which time the price increased to $7.99 for the same quantity. While likely not identical to the pineberry, some Chileans claim that their native strawberry plant is the same as the pineberry. In Chile, this fragrant fruit is referred to as Frutilla Chilena. While the official promotional materials laud the pineberry as a heavenly taste experience, some food critics aren’t as high on the newly commercialized designer fruit. It’s flavor has been referred to as watery, nippy, and tasting like an unripe strawberry. However, like most things, taste preferences are highly subjective, and there are equally numerous positive taste experiences on record. So, judge for yourself. The pineberries themselves are not widely available commercially in the U.S.A. yet, but they will likely be sold again in the United Kingdom next year. You can, however, buy your own pineberry plants by using the links below. Pineberries have been researched and developed an infinitesimally small amount compared to the common Garden Strawberry. Consequently, while there are hundreds of unique and productive varieties of your typical strawberry, the pineberry varieties available today are very few in number. The variety cultivated by VitalBerry BV cannot, at present, be purchased as strawberry plants, plugs, or crowns for home growing outside of the Netherlands. However, Beekers Berries’ Berries @ Home is scheduled to begin offering pineberry plants in the United States and Canada in early 2014. More information will be published nearer the time, along with detailed introduction dates and sales channels. The pineberry varieties that are available are the ‘White Pine’, ‘White Carolina’, ‘White D’, and ‘Natural Albino’ cultivars. The White Pine pineberries are vigorous and will send forth numerous runners. The characteristic red-seeded white strawberries are mild and have the pineapple strawberry taste for which pineberries are becoming well-known. To maintain the pale white appearance of the fleshy accessory tissue of the pineberries, it is a good idea to grow them in a glass house or other growing system. The taste won’t be noticeably different, but full sun will cause a bluish-pink hue to tinge the fruits. A less stereotypical pineberry variety is White Carolina. The pineberries exposed to direct sun will usually have a more evident pink flush than the others. Additionally, this variety is very susceptible to leaf scorch and will likely require fungicides to control it. Organic fungicides may or may not be sufficient to keep it in check. This variety will likely be replaced if and when pineberry research develops more hardy cultivars. 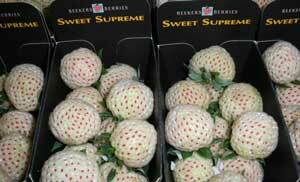 White D pineberries were developed in Sweden and have a bright future. There is the possibility that the genetic traits that dictate strawberry production have endowed this variety with everbearing properties. Should that prove true as testing continues over the next few years, this variety would likely become the most preferred one, at least until superior cultivars are developed. Another positive factor in favor of this pineberry is its fruit size. While still considered small, its berries are generally larger than the pineberries of the other available varieties. The aroma of this variety of pineberry is exceptional and the pineapple flavor is mild. The newest pineberry variety that has reached commercial availability is Natural Albino, a variety patented by and sold by Nourse Farms. The berries still carry the distinctive aroma and pineapple-y taste that is sought after, however, the fruit is quite small: only about the size of a dime or a nickle. Additionally, this variety requires cross-pollination with a compatible strawberry pollinator in order to set any fruit. Nourse Farms sells the Sonata variety along with the Natural Albino plants in a 1:4 ratio. How do you grow pineberries? Pineberry plants are grown just like regular strawberries are grown, with one distinct difference. In order to produce the largest possible crop of the distinct white fruits, it is necessary to have a pollinator strawberry in close proximity. For every four plants, it is best to have one regular strawberry plant for pollination purposes. The early results indicate that the Sonata variety is the best pollinator for pineberries in general, and specifically the Natural Albino variety. For more applicable help, go here: growing pineberries, strawberries. Where Can You Buy Pineberry Plants? 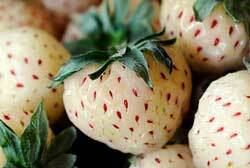 Plants producing the most famous and prototypical pineberry (the white strawberry with red seeds), are available for sale here in the USA. At present, sales are offered seasonally. If they aren’t available or the links aren’t active below, check back in a month or two. Additionally, the plants tend to sell out quickly. 4. Burgess Seed & Plant Co.
For Europeans, it will likely be easier to buy pineberry plants directly from a European country. For EU or UK pineberry plants, you can purchase them by from any of the suppliers in the following list. 10. plantes-et-jardins.com offers Fraisier Anablanca (which listed as Fragaria vesca but appears similar to either the White D or White Carolina varieties mentioned above) and Fraisier Ananas (which may be like the typical pineberry, White Pine) for sale online. Where Can You Buy Pineberry Seeds? Presently, I know of no suppliers who offer pineberry seeds for sale. Pineberry plants for sale can be found at the links above, however, and the pineberry seeds can be saved from the fruits you harvest. However, since the pineberry is a hybrid strawberry, it is very unlikely that plants directly resembling the parent plants will be grown from saved seed. So, if you really want a typical pineberry experience, buy one of the plants, not seeds. For seeds of other hybrid and non-hybrid varieties of strawberries, visit our directory of suppliers who do sell Strawberry Seeds. For more information on pineberry seeds, see Pineberry Seeds for Sale. As a cautionary note, purple pineberry seeds will not grow any sort of strawberry plant. ‘Purple Pineberry’ is a specific cultivar of marijuana. So, ordering and growing purple pineberry seeds off the internet may gain you unwanted attention. The pineberries available today are quite soft when ripe and do not hold up well to shipping. In fact, the inability to keep them in a “fresh” state from the growing location to the store is the primary reason you likely can’t find them on shelves near where you live. Home gardens are, therefore, likely the best place to grow them. Often, the care and nutrients received outside a commercial setting produce better fruits, as studies on growing organic strawberries are showing. At present, the varieties of pineberries that are available do not produce high enough yields or big enough berries to gain widespread acceptance and heavily penetrate the commercial markets like the pineberry’s red-fleshed relative has. However, as they have now been re-introduced, new varieties will likely be bred. If the characteristic flavor is maintained while the size, yield, and firmness increase, those pale pineberries could have a bright future. Hi. I live in Newfoundland Canada. I planted the pineberries last year. They didn’t flower. Instead I had a lot of runners…to the point they got out of control and I had way too many plants. I think I had too many runners and crowded my garden and that’s why I didn’t get any berries. I have it cleaned up now and have a lot of healthy plants, Should I be snipping off the runners next year to encourage flowering? Possibly. The flowers for next spring actually start forming this fall as perennating buds in the crowns of the plants. So, to get the most and biggest berries next year, you need to allow the plants the most development time this fall before the weather induces dormancy. However, overcrowding definitely affects the size of the strawberries also, so try to keep the plants at a ratio of about 3 per square foot, maximum. Good luck! Hi. I bought what I believed to be Pineberry plants last year. They didn’t fruit but I got lots of runners, all of which survived the winter. This summer the fruit did appear but it didn’t look white like those pictured. The inside was white but the outside was light red and not very attractive. The taste was pleasant though. Wondering if I’ve been sold the wrong plants. It is probable that you actually did get pineberry plants. Pineberries themselves will blush pinkish-to-light-red or even light orange with direct sun exposure. So, unless your berries were completely shaded from the sun by the leaf canopy, your berries were probably normal. Good luck! Keep us posted with your results! Good luck! I am in South Africa and would like to get hold of these strawberry plants. How would you be able to assist? Unfortunately, it can be difficult to get plants shipped internationally due to restrictions and customs policies. Your best bet is to check with your governmental customs office and see if it is possible first, and then see what is required. Once they tell you what you must do or have done, you can contact any of the companies/suppliers listed on this page and see if any will work with you to get the plants you’d like shipped to you. Good luck! I noticed a couple of the stores you linked to sell the “Wonderful” variety of the Pineberry. However, that variety isn’t discussed above. What do you know about it? Two of the sites claim it is self pollinating but will give bigger yields when planted with a red. Any ideas about the flavor, hardiness, or other important facts? The “Wonderful” pineberry is simply a trademarked version that allows stores to market it more effectively. The claim about a higher yield with a pollinator is accurate. The flavor is that of a normal strawberry with light pineapple overtones. It will grow where other strawberries will, but anecdotal evidence would indicate that it doesn’t do well south outside of Zone 8 or north outside of Zone 3. Hope that helps!